COSMOS cases made their name because of the unique and bold exterior, the premium materials and the ample space to build “a dream machine”. COSMOS C700P carries the classic design elements of the COSMOS line (aluminium handlebars) and combines them with more innovative technology than any other case to date, originating from the MasterConcept 2.0. Everything about this case is subtle and refined. There are recessed RGB lines carved into the top and bottom accent of the aluminium and glass which make the case look out of this world, without overpowering the look. The left side panel is cut and curved from two single panes of thick tempered glass, something only the COSMOS offers when looking at all the cases on the market. Unique frame design enables regular, chimney effect and inverse layout. Motherboard tray is removable for installation outside of the case. Next generation frame design allows for complete disassembly. Ideal for Case Modders who would like to give their case a paintjob. The iconic aluminium handles shapes the contemporary design and provides easy-to-carry function. PSU, storage and cable management covers for ease of cable management with clean builds as a result. The COSMOS C700P accommodates up to 360mm radiator on the top and 420mm radiator in the front. Please Note: Additional cooling bracket is required to mount radiators to the bottom of the case. Cooler Master COSMOS C700P RGB, Black/Metal, Full Tower Computer Chassis, w/ Tempered Glass Window, E-ATX/ATX/mATX/mITX is rated 4.0 out of 5 by 3. Rated 4 out of 5 by Paradanglers from Overall a very capable case Used this case to make my first watercooled PC. The modular design is on the whole very well thought out although the quality is let down on a few points, namely the doors not being level when closed (easily fixed with some hot water to remove the magnetic strip and a bit of double sided tape to reposition - still not what you expect from a £200+ case though), also the plethora of screw holes in the frame can make it look a bit like an ikea wardrobe at times - see pic. On the plus side the dished back cover allows plenty of room for cabling, I was even able to use one of the SSD mounts to put the corsair fan controller on. The case is of ample height but I can't help feeling it could be just two or three inches longer, but that's being a bit over critical to be honest. Overall I'd be happy to work with one of these cases again. Rated 4 out of 5 by Scottmmwood from It's massive! Cons: My case arrived and the top left led strip was faulty and wouldn't show blue, RMA it and currently waiting for it to be back in stock. Not scans fault they have handled it well. The interior is a fingerprint magnet when building in this I suggest you wear white fabric gloves to prevent this. Fans it comes with are a bit naff. Needs more HDD trays 2 is not enough Pros: This thing is massive built a full x399 system in it and almost lost it it's massive. Put 2 MSI Seahawks X in the case and the aios on those cards don't reach the front intakes it's that big. Looks pretty slick if that's the design your into. Very quite, coming from a Corsair 780T this case is silent with plenty of airflow and options to fit the system including inverted and chimney. 4/5 because of the led fault but it happens 10/10 for the overall product. 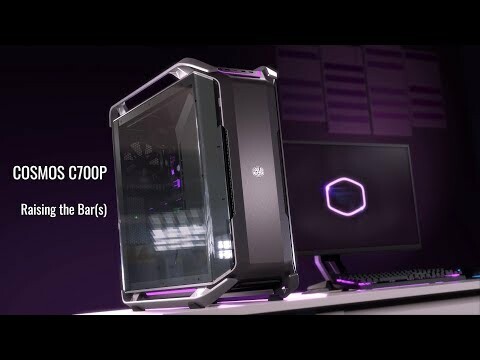 Does this case come with RGB fans as hinted at on the Cooler Master website (for almost &pound;300 I would hope so)? Short answer - No it doesn't. Long answer - The RGB the website refers to are the LED strips on the top and bottom of the case. The fans included are - as one other reviewer put it - a bit naff. But that tends to be the situation with most high end cases as builders usually put their own favourite make and model of fan in and ditch the originals anyway. Hope this helps. How many fans are included with the case? Also is the included fan controller removable? Essentially I want to know if I could potentially replace all the fan's and controller with corsair's which seems to be much better in terms of interface albeit slightly pricey.